The red heart quilt is true WISP. Four of the hearts was made in early 1990ies. Before 1994 for sure. 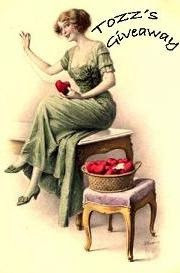 I remember having those hearts in my sewing movingbox! My spring motto have to be: You have to accept some, to enjoy more. Don't you love giveaways!! Here is a new one. Go to Green Fairy Quilts to check it out. I have made a habbit of having at least one stitchery ready to be stitched. This quilters Watch is from a Spanish blog. You find it here. Well, I started playing with some orphan blocks from the OC scrapquilt project. Since Rex is such a wild thing, I came up with this mix of fabrics. Gizmo have tested and approved this little quilt. Hope Rex find it relaxing with some smell of Gizmo. Hi hi. I have two more projects going on that I hope to finnish before May 1. Passing week my sewingroom have been abandoned. Not a single sting done, not by sewingmachine nor by hand. I have been working in my garden fixing and rearranging. I love springtime. This guy in orange fuhr also love spring. Just to show a bit of my garden. Giwe aways are in the mail for all except Carol. She have not contacted me with her snail mail. So Carol - to clame your prize you have to contact me SASP. Catch your breath for a new week. I have joined in on Bloggers Quilt Festival. Amy at Park City Girl started this fun. Go to her blog to find out how to join. My favorit quilt is my Millenium Quilt. It's called Stars in Cyberspace. Click on photo for a big size. 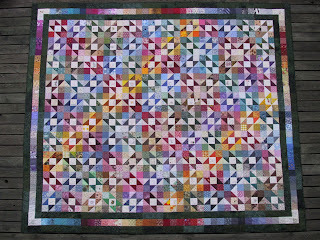 This quilt is a result of swapping with quilters using internet. I started in February 1999 and closed in october same year swapping 25 3" charms and a signature block. Ended up with swapping with 132 different quilters from all over the world. All the signatures is in the quilt but not all the charms. The quilt have signatures from 50 US states and 36 other countries. The block is called Contrary Wife and have the signature in the middle. The top was finnished in desember 1999 and quilting finnished february 2000. The quilt have 1804 pieces, not counting backing and binding. This Quilt have been displayd at an exhibition in Val d'Argent in France. I know some of the quilters contributing to this quilt have seen it displayd found their siggies. The winners need to send their snail mail addys. This give-away is now closed. Winners will be announced tomorrow morning. Now I need to get some sleep. For those who wonder: I did not win the big lottery on saturday :-) But I sure had a good time being in the winning mode. I have found several blogs with great give aways. Tozz's corner is having a 100 post give away. A Quilters life is also having a give away. Just a few days left. Hurry up!! My friend Sissel have enterd blogland!! Pop over to her blog and say hello. She have a lot of beautifull quilts to show you. She have made a magnificant red and white Dear Jane. I am so happy for all the nice give-aways postet on bloggs lately. My luck have been great so far. This is so inspireing for me as a blogger, that I have desided to host a Easter give-away. You can win one of these lamb bottle covers. 2. Post this give-away on your blog link to my blog. This give-away will close at Manday 13. at midnight Norwegian time. Three winners will be picked and announsed next day. I started this quilt, I guess almost 10 years ago. A true scrap quilt as you can see. Through the years of work I probably have done something wrong or not had the right plan. Just look at the quilt, it all crooked!! I was really frustareted when I tried to figure out how to finnish and put on border. It did not match up or look like some of the hexagon quilts I have seen. I wanted the egde to be like shown at det lower picture. (sorry but this is a test with loose blocks/ pieces). I have some serious corrections to do. The quilt was intended to be a lapquilt is now probably ending up as a queen size bed quilt. A friend of mine have done som hexagons and having trouble finnishing off. She simply cut her finnished hexagon quilt into pillows sizes and made several pillow covers. Now she have given me her leftover hexagons. She did not care to work with them any more. The hexagons sure come in handy in my struggle to finnish this quilt. To get my hexagons in a stright line is my gould for this week. It is not that easy having a visiting cat in the house, eager to play. The quilt blocks are layed out on my livingroom floor. Happy Dance in the House! Today the mailman brought at ticket saying that I had to go to the postoffice to pick up a parcel that was too big for may mailbox. It was a packet from Bunny Hill. 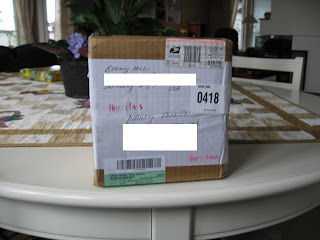 Oh boy, I just received the message that I won a give-away :-) Talk about quick delivery! Look at this wonderfull bundle of 22 FQ from Chelseas Manor that I won. Am I lucky or not? I feel so lucky that I will post a give-away my self soon. I won I won!! Again!! Hugs from Nancy, doing Happy Dance all over the house. This is my new tabelrunner made from the kit from Quilt'n I won some weeks ago. The kit had generous amount of fabric. Enough for two small pieces for side tables. My camera is not working with me so the colours are a bit off in this photo. This is a detail and the colours are a lot better on this one. Easter holiday have started and DS1, DIL, DS2 and Rex have come to visit.